Understanding ham radio (or any type of radio) is impossible without also having a general understanding of the purpose of radio: to send and receive information by using radio waves. Radio waves are just another form of light that travels at the same speed; 186,000 miles per second. Radio waves can get to the Moon and back in 2 ½ seconds or circle the Earth in 1/7 second. These fields make charged particles — such as the electrons in a wire — move in sync with the radio wave. These moving electrons are a current, just like in an AC power cord except that they form a radio current that your radio receiver turns into, say, audible speech. This process works in reverse to create radio waves. Transmitters cause electrons to move so that they, in turn, create the radio waves. Antennas are just structures in which the electrons move to create and launch radio waves into space. The electrons in an antenna also move in response to radio waves from other antennas. In this way, energy is transferred from moving electrons at one station to radio waves and back to moving electrons at the other station. The radio wave–electron relationship has a wrinkle: The fields of the radio wave aren’t just one strength all the time; they oscillate (vary between a positive and a negative value) the way that a vibrating string moves above and below its stationary position. The time that a field’s strength takes to go through one complete set of values is called a cycle. The number of cycles in one second is the frequency of the wave, measured in hertz (abbreviated Hz). Here’s one other wrinkle: The wave is also moving at the speed of light, which is constant. If you could watch the wave oscillate as it moved, you’d see that the wave always moves the same distance — one wavelength — in one cycle. The higher the wave’s frequency, the faster a cycle completes and the less time it has to move during one cycle. High-frequency waves have short wavelengths, and low-frequency waves have long wavelengths. The higher the frequency, the shorter the wavelength, and vice versa. 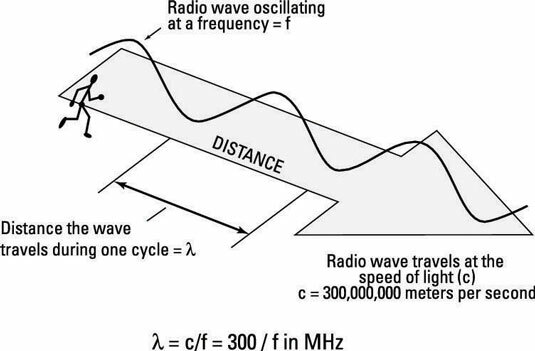 Radio waves oscillate at frequencies between the upper end of human hearing at about 20 kilohertz, or kHz (kilo is the metric abbreviation meaning 1,000), on up to 1,000 gigahertz, or GHz (giga is the metric abbreviation meaning 1 billion). They have corresponding wavelengths from hundreds of meters at the low frequencies to a fraction of a millimeter (mm) at the high frequencies. If you aren’t comfortable with memorizing equations, an easy way to convert frequency and wavelength is to memorize just one combination, such as 300 MHz and 1 meter or 10 meters and 30 MHz. Then use factors of ten to move in either direction, making frequency larger and wavelength smaller as you go. The range, or spectrum, of radio waves is very broad. Tuning a radio receiver to different frequencies, you hear radio waves carrying all kinds of different information. These radio waves are called signals. Signals are grouped by the type of information they carry in different ranges of frequencies, called bands. AM broadcast-band stations, for example, transmit signals with frequencies between 550 and 1700 kHz (550,000 and 1,700,000 hertz, or 0.55 and 1.7 MHz). That’s what the numbers on a radio dial mean — 550 for 550 kHz and 1000 for 1000 kHz, for example. Bands help you find the type of signals you want without having to hunt over a wide range. The different users of the radio spectrum are called services, such as the Broadcasting Service or the Amateur Radio Service. Each service gets a certain amount of spectrum to use, called a frequency allocation. Amateur radio, or ham radio, has quite a number of allocations sprinkled throughout the radio spectrum. Hams have access to many small bands in the MF through Microwave regions. Medium Frequency (MF): Frequencies from 300 kHz to 30 MHz. This segment— the traditional shortwave band — includes AM broadcasting and one ham band. Hams may soon gain access to a pair of bands in this range as the rulemaking process proceeds. Shortwave or High Frequency (HF): Frequencies from 3 to 30 MHz. This segment— the traditional shortwave band — includes shortwave broadcasting; nine ham radio bands; and ship-to-shore, ship-to-ship, military, and Citizens Band users. Very High Frequency (VHF): Frequencies from 30 MHz to 300 MHz. This segment includes TV channels 2 through 13, FM broadcasting, three ham bands, public safety and commercial mobile radio, and military and aviation users. 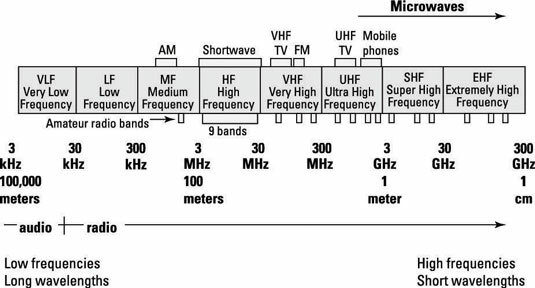 Ultra High Frequency (UHF): Frequencies from 300 MHz to 1 GHz. This segment includes TV channels 14 and higher, two ham bands, cellular phones, public safety and commercial mobile radio, and military and aviation users. Microwave: Frequencies above 1 GHz. This segment includes GPS; digital wireless telephones; Wi-Fi wireless networking; microwave ovens; eight ham bands; satellite TV; and numerous public, private, and military users.